As the saying goes, you only get one chance to make a good first impression, but does that hold true when buying or selling a home? It sure does according to Barbara Corcoran, real estate agent and mogul featured on ABC’s Shark Tank. “Buyers decide within 8 seconds whether they are interested in your home,” says Corcoran. So, when selling your Gainesville home, how do you pack those first eight seconds with the most positive punch you’ve got? Addressing curb appeal. Take a walk to the street right now. See what potential buyers will see. A little more attention to the front of the house and the path your potential home buyers will take may pay major dividends in the end. Just like inside your home, clutter is an immediate turn off. And yes, your yard can be cluttered. Are the recycling bins and trash receptacles sitting outside? Put them in the garage (maybe add a hit bit of deodorizer if needed!) where they belong, or behind a utility fence. Do your gutters need a little TLC? Time for leaves to be gone to show off your beautiful home’s architecture. Have a Gator flag in the front flower bed? You’re going to hate this – but if your new home buyer is a Seminoles fan, you just may have lost the sale. Take it down, keep it safe and ready to place in your new home, whether in Gainesville or somewhere outside the SEC zone. And the weeds? Put your or your neighbors’ teens to work. It’s good for them to sweat and your yard will be all the better for it. 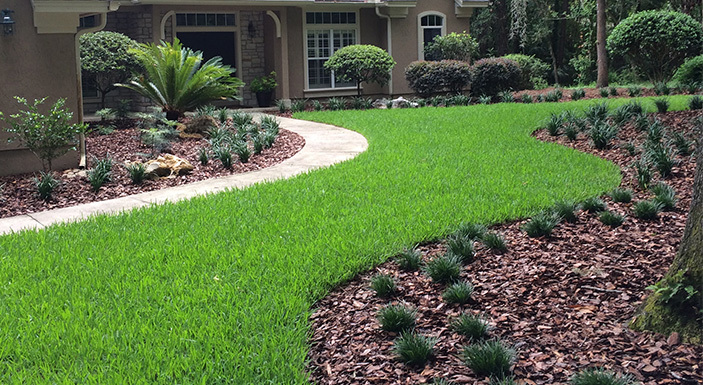 Add some new, fresh mulch and you’ll clean up the look even more as well as help prevent any new weed growth. Beyond the weeding, and mulching discussed above, sometimes the professionals need to be called in. Many beautiful Gainesville homes built in the 90s (and 80s and 70s) are simply being swallowed up by the original landscaping. As trees and shrubs have matured, they’ve become overgrown and just tired. He added, that many customers today are looking for low maintenance, draught tolerant plants, so he is working more and more with native plants, low lying ground cover and even decorative boulders to complement the home’s architecture. Before - there really is a house behind those shrubs! Mature landscaping has taken over resulting in a crowded look that doesn't let the home be seen. After - with some editing and trimming of both shrubs and lawn, the result is a cleaner, more welcoming entrance to the home. A Beautiful Yard is also seeing increased requests from Gainesville homeowners for updating walkways leading to the front door. “The vast majority of homes have a standard 3-foot-wide walkway. 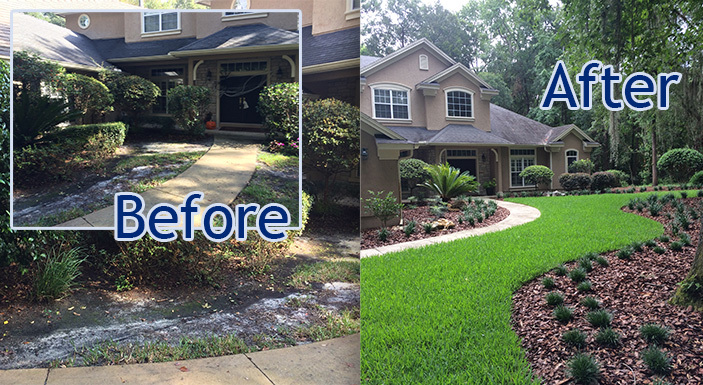 An update with natural stone pavers with a widened walkway of about 5 and a half to 6 feet really makes it that much more inviting.” Home buying in Gainesville – and anywhere – is a huge undertaking. A new home buyer is making a judgement with every step – make sure the steps they take to your home are the best they can be. And once a home buyer is at the front door, what will they see? Chipped or faded paint? Tarnished locks? Invest in a new paint job and perhaps switch out hardware on the front door. Add some seasonal color to planters that are appropriately scaled to your home and its grand entrance. Invest in a great new door mat to welcome guests and potential buyers. Again, you have 8 seconds to lock in that positive first impression. Don’t blow it at the front door! Whew. And now Gainesville home buyers are in the front door and ready to see what is behind the beautiful first impression your home’s curb appeal just made. For more tips on how to ready the inside of your home for sale, click here!